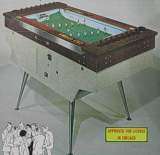 Coin-op Soccer Table published 51 years ago by Bally Mfg. World Cup © 1968 Bally. A 2-player electro-mechanical table soccer game with 8 levers and a goaly control on each side.